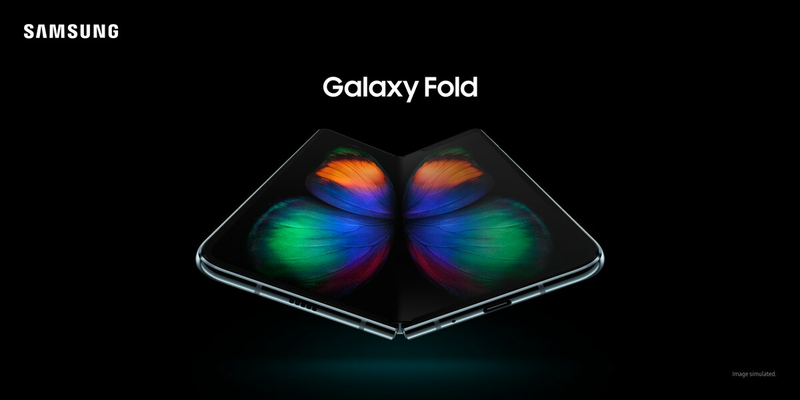 The Samsung Galaxy Fold will be available in Space Silver, with 512GB memory, a 4,380 mAH battery and wireless PowerShare capabilities. And, your new superphone comes with a free carbon fiber case and Wireless Galaxy Buds - all included! During congestion the small fraction of customers using >50GB/mo. may notice reduced speeds until next bill cycle due to data prioritization. Video streams at 480p. T-Mobile ONE: Credit approval, deposit, and $25 SIM starter kit or$20 upgrade support charge may be required. Unlimited talk & text features for direct communications between 2 people. Unlimited high-speed data US only. In Canada/Mexico, up to 5GB high-speed data then unlimited at up to 128kbps. Standard speeds approx. 128Kbps. Netflix On Us: Offer subject to change. Receive Netflix Standard 2-screen (up to $10.99/mo. value) while you maintain 2+ qual'g T-Mobile ONE lines. 1/account; may take 1-2 bill cycles. We cover 99% of Americans with LTE. See coverage details @ T-Mobile.com.